Fire Emblem Echoes: Shadows of Valentia is a tactical role-playing game developed by Intelligent Systems and published by Nintendo for the Nintendo 3DS handheld video game console. 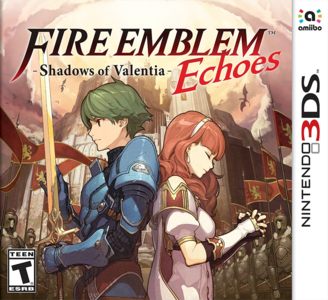 Fire Emblem Echoes: Shadows of Valentia suffers from minor graphical glitches and minor audio glitches. The graphical glitches are almost exclusive to dialogue, where a checkerboard pattern of slightly darker squares remains in the background. No other graphical glitches occur. The audio glitches are nothing more than crackling if running at 100% speed, turn on audio stretching if the game will not run at 100% speed on your device. Player experience: Game is playable from start to finish without workarounds, most cutscenes run slowly, but dialogue scenes are near-perfect. All textures, models, lighting effects, and animations play without fail. Amiibo functions exactly as intended. Citra will randomly decide that your emulated SD card no longer exists when attempting to load DLC.